I love my rest days. Rest is such an important component of training. Not just because you can sleep in (I love sleep) but also because you are allowing your body to heal a little before you run again. 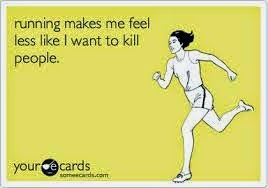 I never run two days in a row (I know, that's crazy right?). I used to...then I got injured. My amazing orthopedic surgeon (Dr. T) gave me strict instructions to take at least one full rest day between my running days. 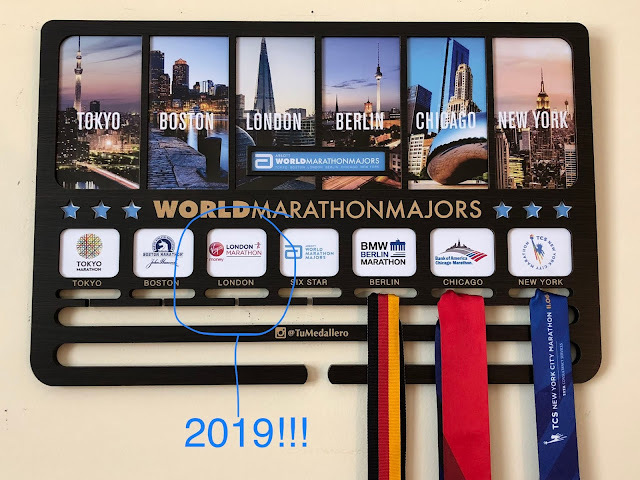 I love Dr. T...not because he is great at his job, but because he told me that my knees can "run the Boston marathon"...so in other words he is the smartest orthopedic surgeon in the world! It's not always easy to take a rest day. There are those moments that you are so focused on your training that you want to do more and more. Resting doesn't seem like such a great option when you could be at the gym cross-training or strength training (or packing in more miles). Even if you follow the 3-days-a-week running philosophy you don't want to "lose a day" by not doing anything. Those are the moments when you have to take a step back and look at the bigger picture. Training for a marathon IS a marathon, not a sprint. So you don't get there by going all out and "leaving it all on the track (or road)" each and every day. Instead you focus on endurance, taper when you need to, listen to your body, and allow yourself to love your rest days as much as your run days, so that you will be able to love your run days even more. My rest days are separate from my cross-training or strength-training days. 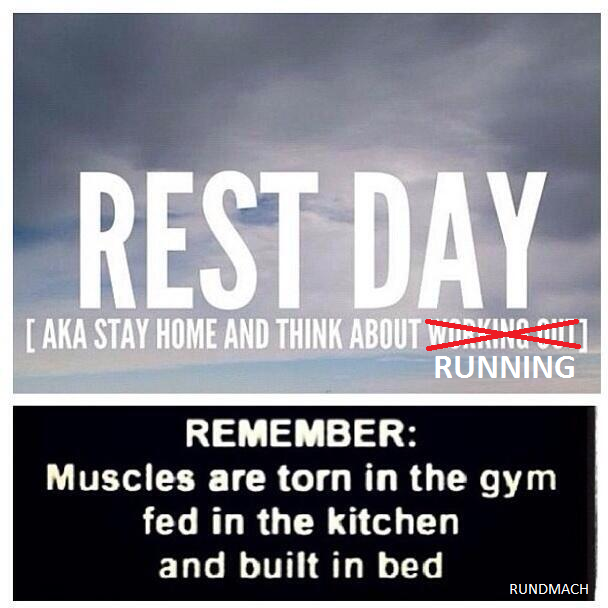 I have two mandatory rest days each week (the day before and after my long run day). How many rest days do you have each week? 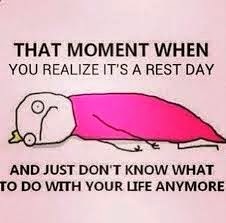 What day(s) of the week do you have as your rest day(s)?